Raghu Malhotra is the President of Mastercard Middle East and Africa and sits on the company’s global management committee. 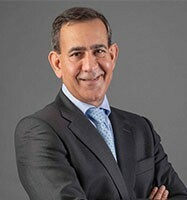 Based in Dubai, Malhotra is responsible for driving the company’s global strategy across 69 markets and has led the company’s transition to being a pioneer in bringing new electronic payment solutions and services to the region, spanning safety, security, data and artificial intelligence – and helping to advance social progress and inclusive growth. Under his leadership, Mastercard has expanded its collaboration with Central Governments and public sector authorities across the Middle East and Africa, partnering to enhance the region’s infrastructure and digital ecosystem. In support of this, Mastercard has developed and launched a number of technology ‘global-firsts’ that are impacting the lives of millions of people: empowering citizens and businesses by creating interoperable mobile ecosystems; launching lending platforms which digitize and revolutionize supply chain management; bringing new levels of security to online and in-store purchases with path-breaking biometric technology; and introducing new energy and agriculture digital solutions to enable greater access and financial inclusion. With a career spanning 25 years, Malhotra has held a variety of senior leadership roles at Mastercard, encompassing multiple geographies and functions. Prior to joining the company, he served in a variety of senior leadership roles at Citicorp, American Express and ANZ Grindlays Bank. Malhotra holds a number of board and advisory positions across international markets. He is a member of the board of directors of INJAZ (Junior Achievement Worldwide), a member of the World Economic Forum Africa Business Council and also has an advisory role in the Rwandan Ministry of Finance and Economic Planning’s Informal Sector Pensions Project. Malhotra has received a number of prestigious accolades, including being named among the top business leaders by Forbes consecutively from 2014 to 2018. He holds an honors degree in Commerce from the University of Delhi and an MBA from the Melbourne Business School, University of Melbourne. He also has participated in management training at IMD, Lausanne.